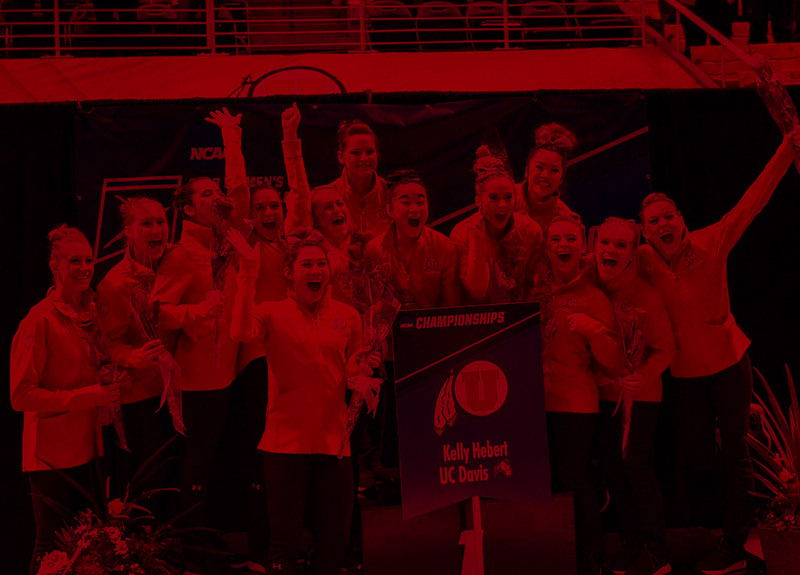 Major changes are in store for the NCAA gymnastics postseason in 2019, but the Utes hope one thing remains the same—a Utah team competing for the national championship. No program in the country can match Utah in national championship appearances, currently an unprecedented 43 in a row including all 37 NCAA Championships. While reaching the NCAA Championships will get tougher in 2019 with the field trimmed from 12 to eight teams, the Utes have been planning for this day through recruiting, scheduling and training. "We are not interested in just qualifying into the national championship, we want to get Utah back on top of the podium," said Utah co-head coach Tom Farden of a program that owns 10 national championships but has come no closer than second (most recently in 2015) since its last title in 1995. "The strategy behind our recent and future signing classes is to recruit gymnasts who embrace competing in pressure situations and have demonstrated the ability to thrive under those conditions. We have been putting a bigger premium on results in both our recruiting and our training," explains Farden. Senior Kari Lee is one of five returning Ute All-Americans. Two-time NCAA champion MyKayla Skinner and All-America all-arounders Skinner, MaKenna Merrell-Giles and Missy Reinstadtler are prime examples of that recruiting philosophy. The trend continues with this year's freshman class, which features four high achievers at the Junior Olympic level, including two J.O. champions. "All of our freshmen are accustomed to winning at the J.O. level," said co-head coach Megan Marsden. "They are highly motivated to win and are comfortable with high expectations." The 2019 schedule was also designed around preparing the Utes for postseason success. Utah will face a series of national powerhouses, including defending NCAA champion UCLA and perennial contenders LSU, Georgia and Michigan. In addition, two podium meets are on the schedule for the first time in school history: the GymQuarters Invitational in St. Charles, Mo., and the Pac-12 Championship in West Valley City, Utah. Getting comfortable on podium, which is used at the NCAA Championships, is just one of Utah's scheduling wrinkles this season. To facilitate the new quad meet format at the regional and national championships, the regional meet has grown from a one to a two-day event (three days for non-seeded teams). At nationals, the teams that advance out of semis into the inaugural four-team final will also compete on back-to-back days. To prepare, the Utes will incorporate consecutive days training full routines in practice on a regular basis. They will get a dose of the real thing over President's Day weekend when they meet LSU, Missouri and Stanford on Feb. 15 in the GymQuarters Invitational and then fly to Stanford for a dual meet with the Cardinal on Feb. 18. Junior MyKayla Skinner has won a pair of event titles and finished as the NCAA all-around runner-up twice over the last two seasons. "Training full routines two days in a row in the gym is helpful from a physical standpoint, but competing in actual meets spaced closely together will introduce the emotional and mental element that you can't simulate in practice," says Farden. That is not to say Utah's practices are not competitive. Far from it. The 10 returners from last year's fifth-place NCAA team include five All-Americans, an NCAA champion, four regional and two Pac-12 champions. Joining them is an influx of freshman stars headlined by J.O. national champions and former J.O. National Team members Cristal Isa and Adrienne Randall. The competition has helped form the team's identity. "There is not a sense of hierarchy, which is refreshing," explains Marsden. "The upperclassmen feel the freshmen will help us reach new heights and they don't want them to feel undervalued. The freshmen are already team players, which can take a while coming out of club, but they embraced it right away." There may not be a hierarchy on the team, but there is nationally, and Skinner is right there at the top. The NCAA floor champion as a freshman in 2017 and the vault champion in 2018, Skinner was the NCAA all-around runner-up both seasons. The amazing news? The 18-time All-American, six-time regional and five-time Pac-12 champion is still improving. "MyKayla is like a machine, she is so close to perfect," marvels Marsden. "While she doesn't have many areas where she can improve, she is working on sticking more beam dismounts and more vaults. She has also added a big release move on bars (the Ray)." Junior Missy Reinstadtler earned All-America honors in the all-around at the NCAA Championships last season. The supporting cast around Skinner keeps getting better as well. Merrell-Giles, an All-America all-arounder and the reigning Pac-12 vault champion and regional floor co-champion, scored a 10.0 on both events last year. "MaKenna is a 9.90 scorer across the board. She has a pure love for the sport, a great attitude and a work ethic second to none," said Marsden. "MaKenna is also a great leader, along with Kari Lee." Lee is another senior All-American with impressive all-around results. One who took her gymnastics to a new level in the postseason last year was Reinstadtler. She won the regional beam title and an All-America all-around performance at the NCAA Championships signaled her emergence as a national force. Reinstadler has incorporated a Yurchenko one and a half vault in the offseason, which is also performed by Merrell-Giles and junior Kim Tessen (Skinner competes a double). Tessen is the wildcard of the group. She has a 9.95 best on vault and is also a 9.90 scorer on bars, but has been held back by injuries in her first two seasons. The coaches were anticipating another 10.0 vault in their lineup from freshman Cammy Hall before she suffered a season-ending injury in November. "Vault is the separator in NCAA gymnastics these days," said Farden. "If we stay healthy, we will remain among the elites on this event with five 10.0 valued vaults in our lineup." Senior MaKenna Merrell-Giles was the Pac-12 vault and NCAA Regional floor champion last season. Headlining the senior class are co-captains and nationally-ranked all-arounders MaKenna Merrell-Giles and Kari Lee. Merrell-Giles is a six-time All-American, who as a junior in 2018 was the Pac-12 vault and NCAA regional floor co-champion. Three-time All-American Lee returned to the all-around lineup seamlessly last season after redshirting with an injury in 2017. Macey Roberts (floor and vault) and Shannon McNatt (beam) have also contributed to Utah's success and McNatt was the 2017 NCAA regional balance beam champion. MyKayla Skinner could make a case for herself as the country's best collegiate gymnast over the last two seasons. Skinner not only has two NCAA individual championships, two NCAA all-around runner-up finishes, five Pac-12 titles, six NCAA regional titles and 18 All-America awards, she is unrivaled when it comes to consistency. The 2016 USA Olympic alternate hit all 110 of her routines in her first two seasons—even more remarkable given the exceptional degree of difficulty in her routines. Look for Missy Reinstadtler to continue her surge into the national conversation. Reinstadtler came into her own during the postseason as a sophomore last year, winning the NCAA regional beam title and earning All-America honors in the all-around at the NCAA Championships. Kim Tessen adds a 10.0 valued vault and a big bar routine to the lineup when she is healthy. Sydney Soloski will factor heavily again on floor—where she was an NCAA All-American as a freshman—and along with Alexia Burch, is also a strong candidate on beam. Soloski produced seven 9.90 or better floor scores (including two 9.925s) as a freshman and competed well under fire on both floor and beam at the NCAA Championships. Burch scored a 9.90 best on beam last year and her aggressive, confident approach to the event could land her the critical leadoff position. Lauren Wong is a viable option on the uneven bars and she is training on all four events in her first preseason (she joined the team at the semester last year). Crystal Isa instantly makes Utah's bar lineup stronger as a two-time J.O. national champion on the event. A two-year member of the USA Junior Olympic National team, Isa placed in the top four all-around at both the 2017 and 2018 J.O. Nationals. She is projected as a possible all-arounder as a freshman. Adrienne Randall is the other J.O. champion in the class, with her national title coming on beam. She tied with Isa for fourth in the all-around at the 2018 J.O. Championships. Hunter Dula, a three-time qualifier into the J.O. Championships (2015, 2017-18), tied for fourth on bars in 2018. Cammy Hall, a qualifier into the 2018 J.O. Nationals, was projected to start on both vault and floor before an injury in November that will keep her out all year.